Semi-automated ESD tester featuring Ecdm 400E, Universal ESD Simulator. 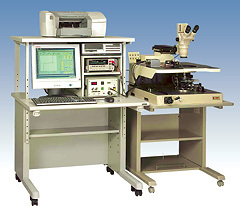 Used with a manual wafer probing system or a die manipulator, wafer or die level semi-auto ESD test can be done, as well as packaged device test. Damage is detected by V-I curve or leakage current change detection. Stress level and measurement points are programmed by personal computor via GP-IB. Once test terminals are selected, ESD endurance is automatically measured. Meets every standards such as MIL, EIA/JEDEC, JEITA, AEC and ESDA (HBM and MM). V-I cucrve can be monitored on PC display during ESD test. Current through multiple ground return can be monitored separately. ESD waveform can be customited to user specs as well as above published specs. Rapid test is possible because a little programming and no DUT board required. Picoammeter may be available as an option.